St. Patrick’s what? 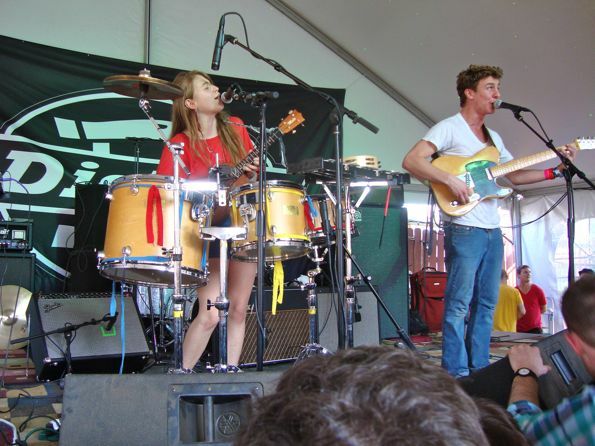 The holiday went nearly unnoticed on the second day of SXSW, where the performances were all about high energy, dance parties, folk influences, and coed vocals – sometimes all at once. 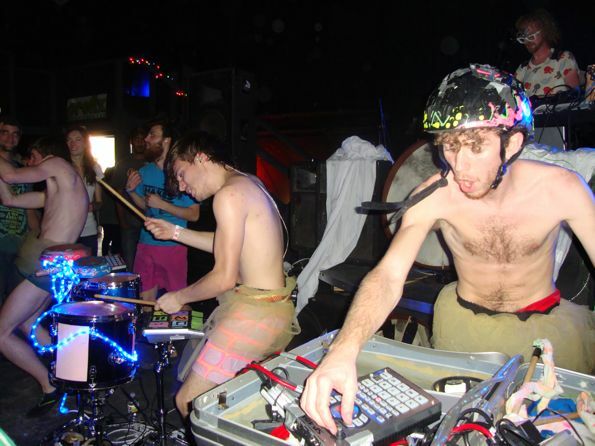 Canadian electronic group Gobble Gobble bashed away gleefully at homemade instruments while wearing homemade tutus. Although 11:50 am is not an optimum time slot for bright lights and interactive theatrics, the crowd couldn’t help but get into it. 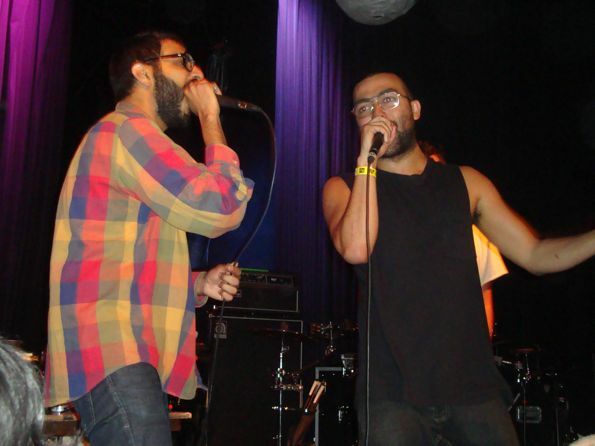 “This is another mediocre rap song by mediocre rap group Das Racist,” quipped one of the group’s emcees during their set. The packed crowd’s positive reaction must have helped their self-esteem; they ended their simultaneously laid-back and high-energy performance by walking off to “Simply the Best,” their fists in the air. 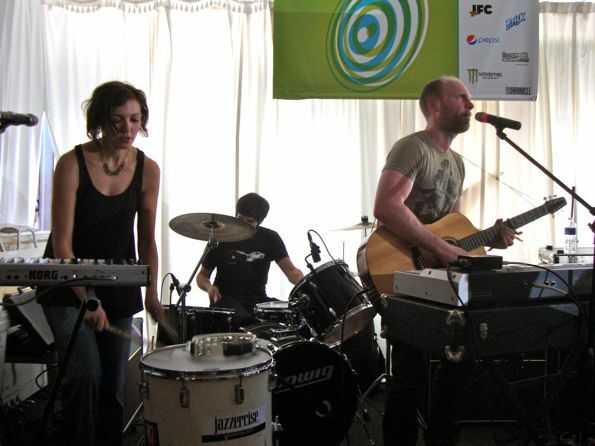 The Rural Alberta Advantage writes songs that are in some ways very specific (i.e., about rural Alberta) and yet widely relatable. 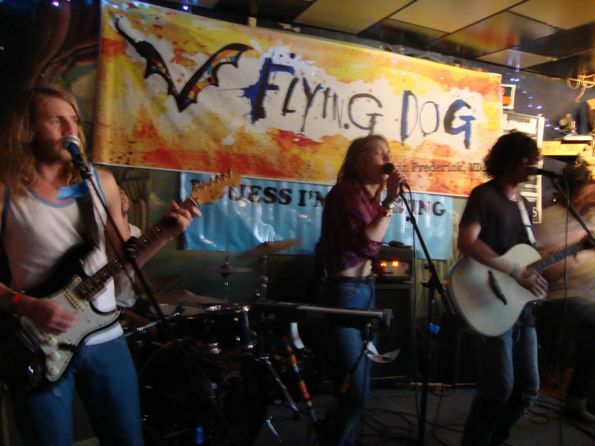 Their sound bears hints of Neutral Milk Hotel mixed with keyboards, coed vocals, and unusually powerful drumming. As always, their set at the BrooklynVegan showcase was both charming and moving. The word has been spreading about Grouplove‘s live performances; the British quintet inspired smiles all around with their positive, high-energy sing-alongs. 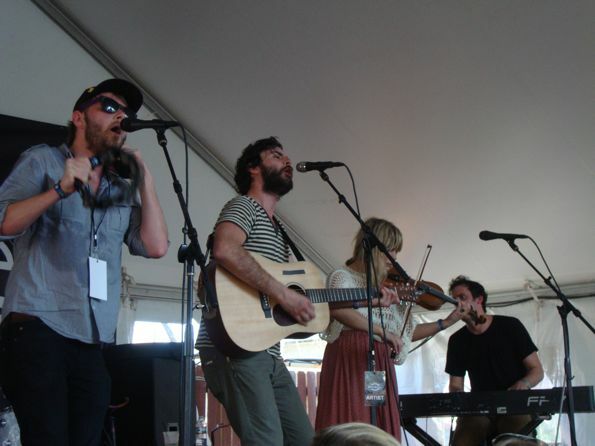 The Head and the Heart impressed the capacity crowd at the Dickies party with their full-bodied Americana, distinguished by rollicking piano, violin, and rich vocal harmonies. Louisiana’s Givers grinned and danced their way through their set, and the audience followed suit. 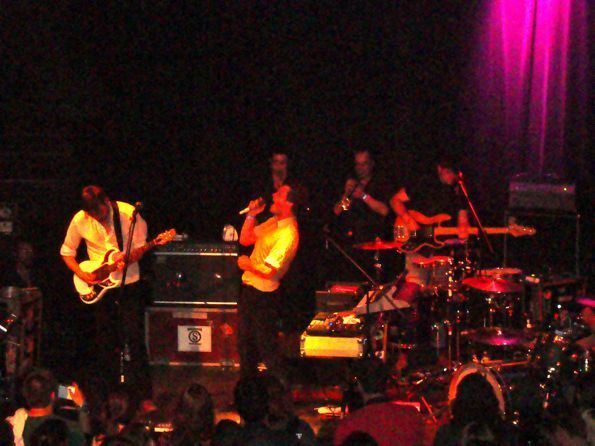 The band’s huge, ecstatic, and original sound combines irresistible rhythms (courtesy of two drummers) with shimmering guitar, synthesizers, and folky vocal harmonies. Numerous conversations about how “this band is about to blow up” ensued. Take note. 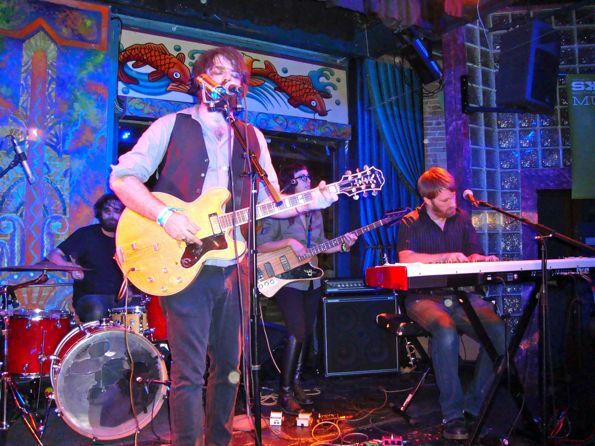 Austin locals My Jerusalem are posed to gain fans of their high-octane, sing-along folk rock. However, they may want to refrain from taking cracks at people in the audience “taking pictures for your blog that two people read.” Really? This is SXSW–love your bloggers. 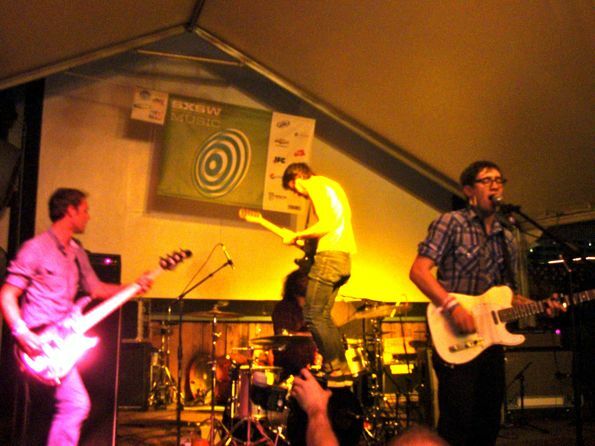 Washington’s The Lonely Forest was one of my favorite discoveries at SXSW 2010; I was glad to see them playing to a bigger crowd this year. Their passionate rock has no gimmicks or quirky instrumentation, but easily rises above the pack due to John Van Deusen’s singular songwriting voice and nonstop hooks that are both memorable and meaningful. They announced that their new album, Arrows, is coming out next week. I highly recommend checking it out, as well as their 2009 release, We Sing the Body Electric. It’s hard to believe that a couple of years ago, Friendly Fires were playing festivals as a new buzz band; it seems perfectly natural for the dance-rock kings to be playing sold-out shows like they did tonight. “I’m the queen diva of New Orleans, and you’re about to experience bounce music,” the rapper Big Freedia announced at the beginning of his set. And experience it we did, with all the glorious booty-shaking it entails. 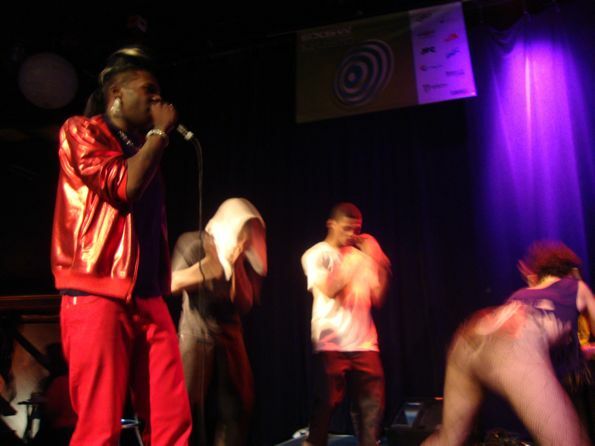 His four charismatic dancers plus enthusiastic audience members made sure that the stage was a blur of “azz everywhere,” as Freedia sang in his most memorable song.